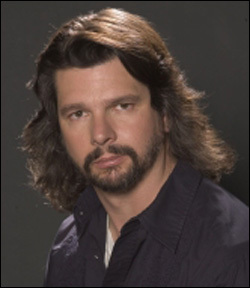 In case you didn't know, Ron Moore (Battlestar Galactica) started a blog to jot down his personal musings during the strike, which is rarely updated yet fairly insightful and a must read if you track that kind of thing at all. There was a great story about staff writers on Star Trek TNG peering through a window from their office building over to the next with binoculars into Rick Berman's office trying to figure out how he was mangling their scripts on any given day. Good stuff, and naturally he had a short statement on Letterman's company Worldwide Pants striking a deal with the Writers Guild of America, allowing him to return to the air with his writers while no other late-night talkers will be able to. Unless the network that owns them makes a similar deal, that is. There are some bitchy comments out there in the blogosphere from â€œunnamedâ€ feature writers complaining that itâ€™s somehow â€œunfairâ€ that Lettermanâ€™s writers are going back to work and theyâ€™re not. The Guild has already stated as a matter of policy that theyâ€™re willing to negotiate deals with individual companies outside the umbrella (butterfly net?) of the AMPTP, so the fact that theyâ€™ve been able to pull off one such deal shouldnâ€™t be the occasion for whining about how â€œIâ€™m not working and they are,â€ it should be a time to celebrate the fact that at least one company doesnâ€™t feel the Guildâ€™s demands are ridiculous or particularly onerous. Not much more to it than that, but go read it anyway. Something I found pretty cool was the end bit where Moore says he's adding The Late Show to his TiVo "season pass" (meaning record all episodes.) I don't have a TiVo, but I do have a DVR and I did exactly the same thing the very minute I heard the news that a deal had been signed. It's going to feel a little odd, though, because the more people that watch, the better the ratings will be, the more money CBS will make for screwing writers by not paying them fairly. At least we'll get to watch the writers rip on CBS and the other companies with impunity, though, right? Letterman returns to the air on January 2nd.